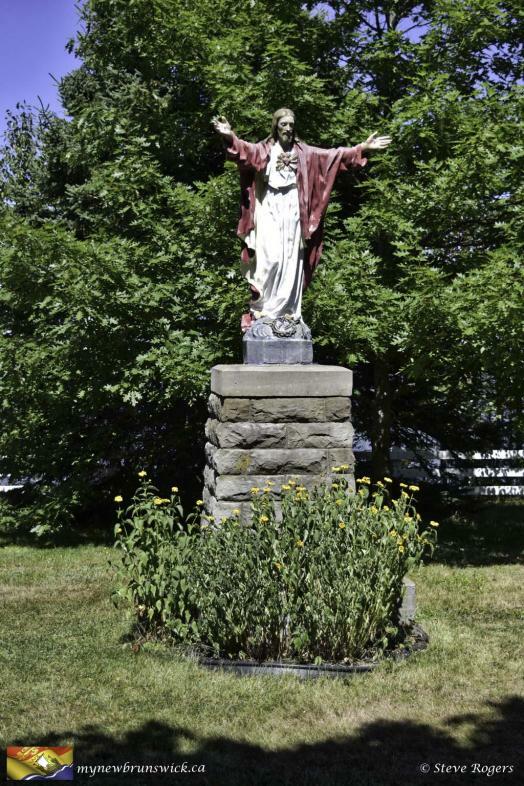 Built on a land bequeathed by Alexis Landry in 1791, the sanctuary includes a chapel, a Way of the Cross, a well, a fountain, a cemetery and monuments, all in a hedged farmland. 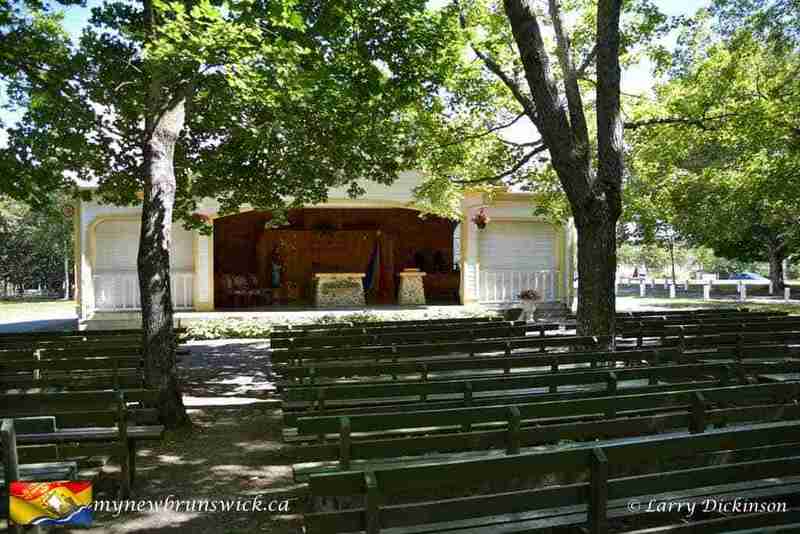 The chapel, which is one of the oldest places of Acadian worship, is also an enigma. 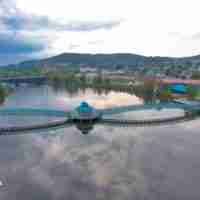 The exact reason for its construction is indeed unknown but linked to the historic quarrel between the inhabitants of the east and west of the city. As a place of pilgrimage during the second half of the 19th century, the sanctuary is still very popular, both by the inhabitants of the city and by tourists. 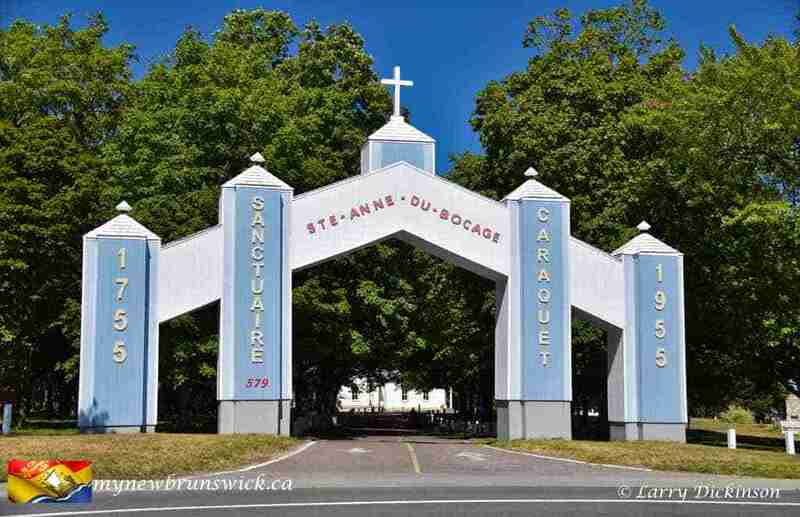 Sainte-Anne-du-Bocage is located in the western part of the town of Caraquet. It is accessible by Saint-Pierre-Ouest Boulevard. 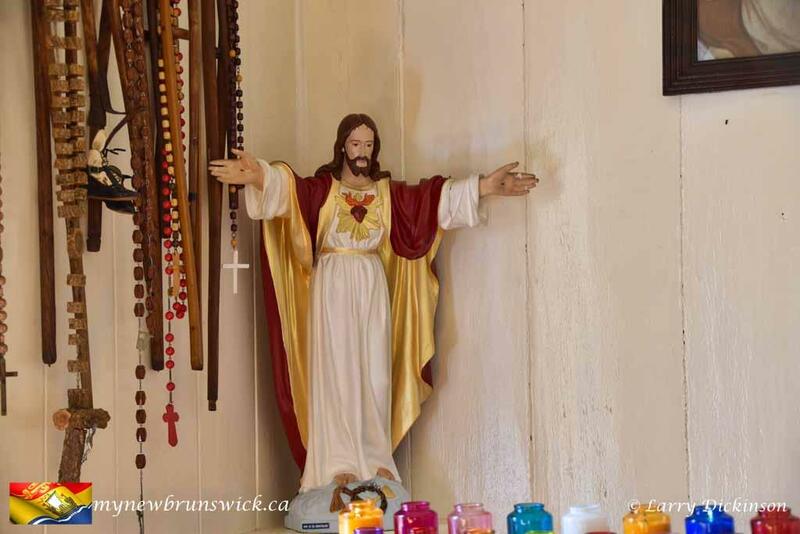 The place is located on a plateau culminating at about seven meters above the bay of Caraquet. 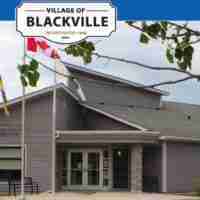 Sainte-Anne-du-Bocage is also the name given to the neighbourhood in which the park is located. Alexis Landry (1721-1798), a merchant born in Grand-Pré and survivor of the Deportation of Acadians, settled in Caraquet probably around 1757 with three other families. Escaping deportation again during Roderick MacKenzie’s raid in 1761, Landry left his land with his family for a few years to ensure his safety. In the spring of 1768, the Landry returned to the scene and 13 March 1769 , Magistrate George Walker officially allowed them to settle on the site they occupied in 1761, provided that he was not already occupied. Alexis Landry received the title of official title in 1784. A church would have already existed on the site of Sainte-Anne-du-Bocage as early as 1784 or perhaps as early as 1772 or 1771. 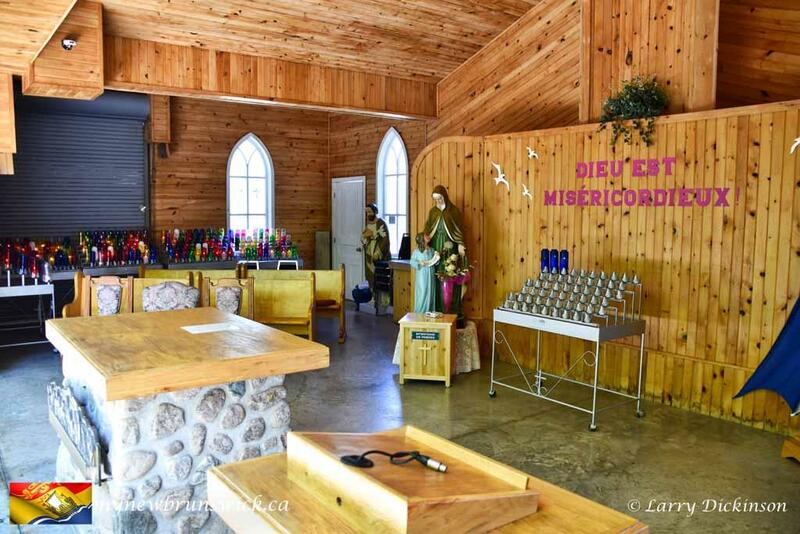 This church, dedicated to Saint Anne, was constructed of logs on land given by Landry, with the permission of the Jesuit Jean-Baptiste de la Brosse. 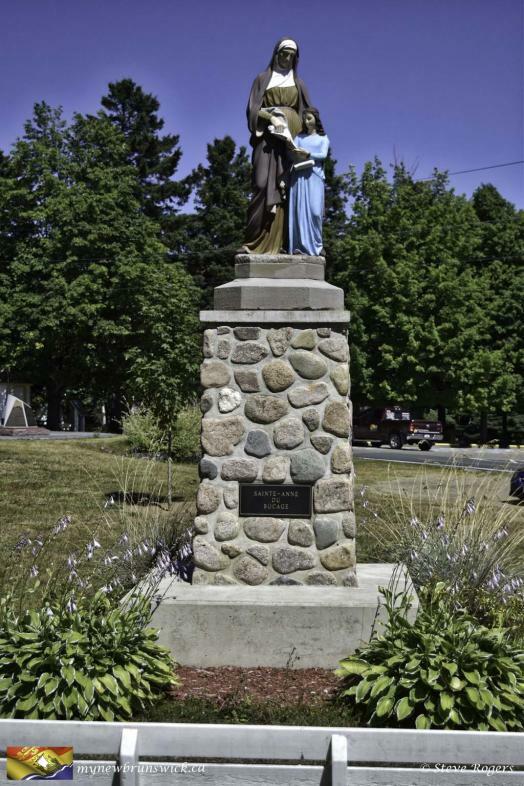 In fact, Landry had installed a statue of St. Anne as soon as he arrived in 1757. Before the missionaries were sent, and during their absence, Alexis Landry celebrated white masses, that is to say, without a priest. 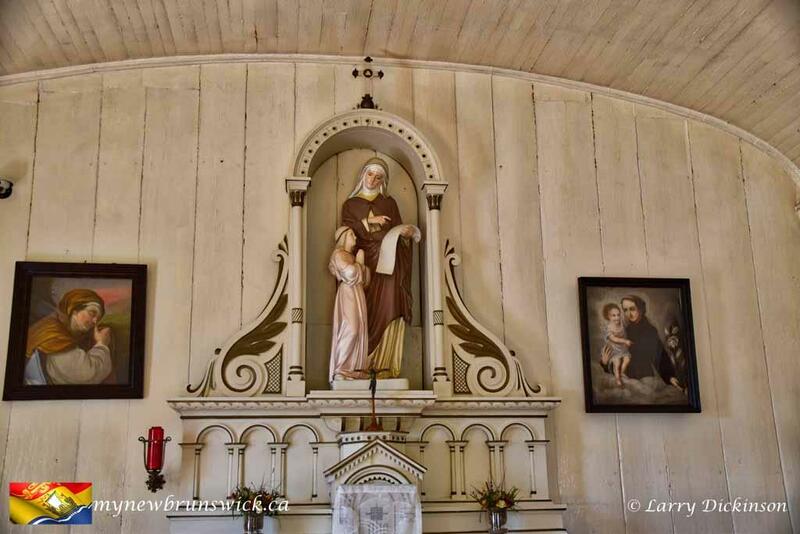 In 1766, barely ten years after the deportation of the Acadians, the bishop of Quebec promised the sending of a missionary to serve all the Acadians of the Maritimes. 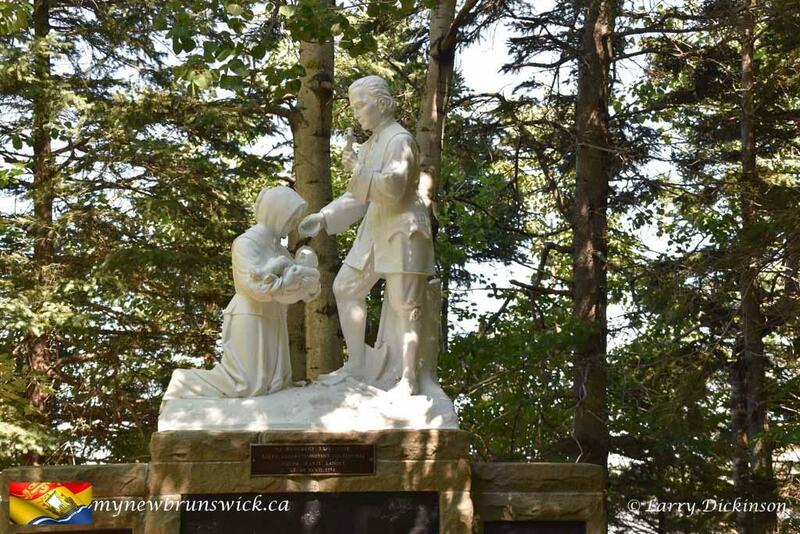 Due to its geographical position and the size of its population, Caraquet was frequently visited by missionaries. The first was Charles-François Bailly of Messein (1768-1773), followed by Mathurin Bourg (1773-1785) and then Antoine Girouard (1785-1787), who became the first missionary resident at Caraquet in 1787. In 1786, Father Girouard unsuccessfully attempted to move the church towards the center of the town and then apparently renovated it. Mathurin Bourg was resident at Caraquet again from 1787 to 1794. In 1791, Alexis Landry took steps to build a church ther . Mathurin Bourg wanted it to be built near the cemetery although it had already been planned for several years to build a church in a more central site. The 10 July 1793 , Landry ceded part of his estate for the construction, provided that he and his heirs had the free use of a closed bench of 4 places and that the cost of his funeral was provided by the factory. Olivier Blanchard obtained the contract of the construction. The church was blessed in July 1794 by the Abbe Bourg. It was made of round wood, pieces on parts, the most common type of construction among the Acadians between 1755 and the beginning of the 19th century. After the construction of the church, the following missionaries celebrated masses: Jean-Baptiste Castanet (1794-1795), Mathurin Bourg (1795-1796), Jean-Baptiste Castanet (1796-1797), Louis-Joseph Desjardins -1798), René-Pierre Joyer (1798-1806), Urbain Orfroy (1806-1813) and Phil-Antoine Parent (1813-1817). Thomas Cooke became a resident missionary at Sainte-Anne-du-Bocage in 1817. A fire destroyed several buildings on 28 August 1795 But the church is spared when the wind suddenly changes direction; According to Alexis Landry, it is respect for a promise that saved the church. The church of Sainte-Anne-du-Bocage was located too far for the inhabitants of the east of the city and was abandoned around 1818. 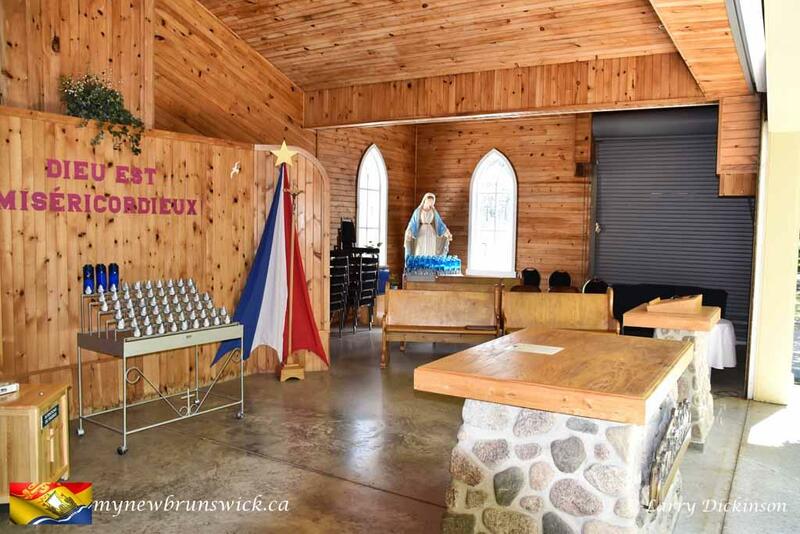 After many steps, a new church was built in 1818 in the Pointe-Rockuse area, near the present church of Saint-Pierre-aux-Liens, a more central place. A new chapel, the one visible today, is still built in the Bocage. According to Rosemonde Landry, its construction would have taken place between 1829 and 1844 whereas, according to a letter discovered by Fidèle Thériault, it was built in 1836 or later; According to other sources, an interval between 1832 and 1836 is cited. In addition to its unusual architecture, it seems that the chapel was not used regularly for the Mass. Three popular hypotheses explain the reason for its construction: the first is that it is a monument to the survivors of the Deportation, the second that it is a means for the parishioners to improve their chances of having a church installed in their neighbourhood. And finally, according to the third hypothesis, it would be a chapel built by sailors who had survived a shipwreck in thanks for their survival. The construction of a stone church measuring 48 feet by 120 feet began in 1837. The works were interrupted in 1853, for lack of money and following a decision of the bishop. 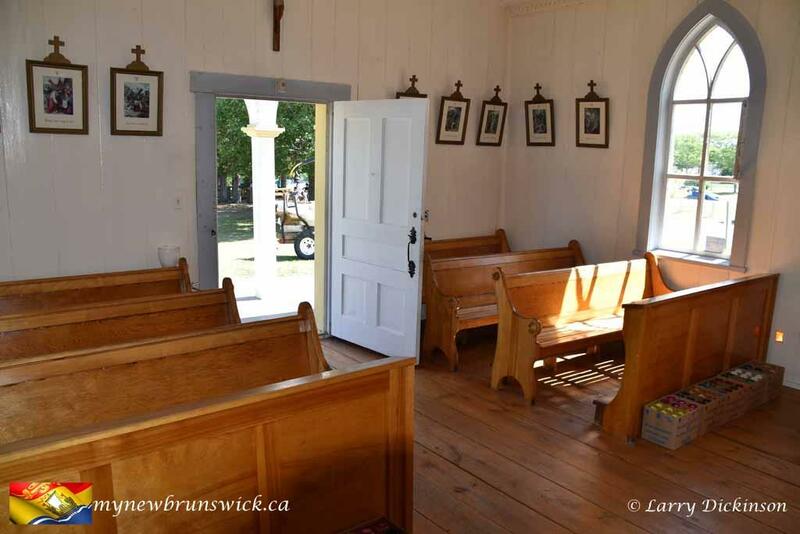 The church of Saint-Pierre-aux-Links was finally built in the center of Caraquet between 1857 and 1860. Several sources mention the year 1914 as that of the first pilgrimage of the Sainte-Anne, on the occasion of a shipwreck. Louis-Joseph Desjardins, a missionary between 1797 and 1798, had already proposed the establishment of a pilgrimage. In fact, according to the research of Rosemonde Cormier, the first pilgrimage takes place on 26 July 1857 , following a shipwreck of the previous 22 July with 56 dead. The first major pilgrimage took place in 1880. 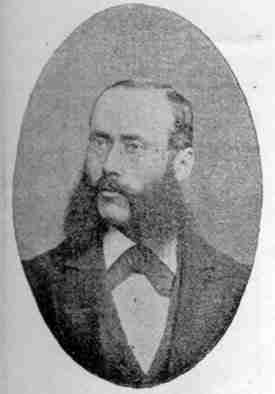 The first mention in the press dates from that year, but the first true account is only published in 1886. 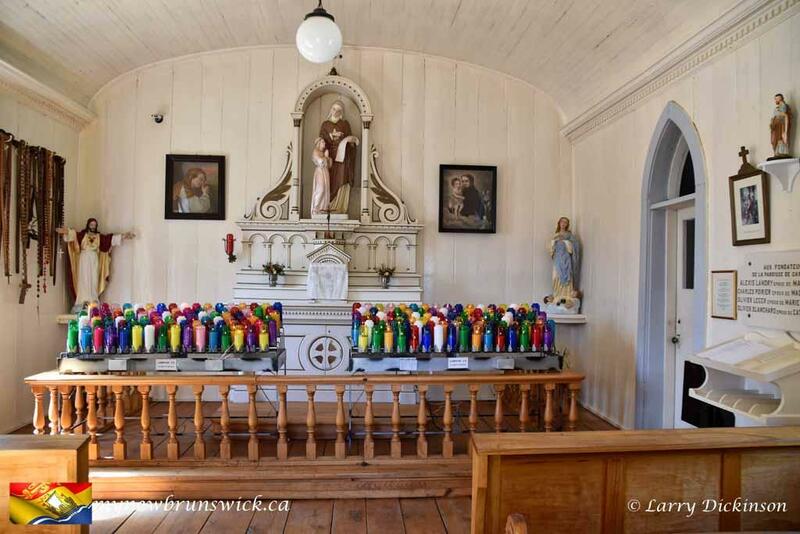 The Caraquet & Gulf Shore Railway was built nearby in 1887 and even before the work was completed in November, the train made a stop at Sainte-Anne-du-Bocage station, allowing pilgrims from as far away as Bathurst to come to the sanctuary. The tickets were half-price at Saint Anne’s, the company encouraging this kind of celebrations. The chapel was renovated in 1904 and the Gothic windows were installed a few years later. An extension at the back of the chapel, allowing to celebrate masses outside, was inaugurated in 1909. 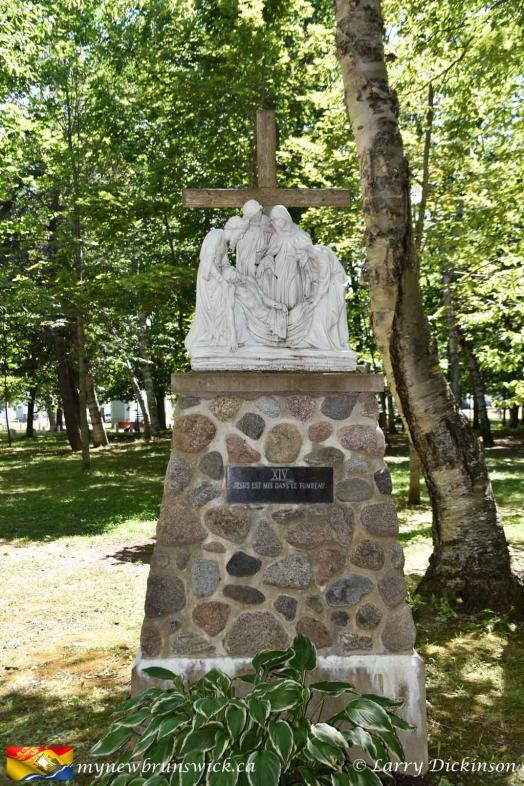 The 4 June 1914 , The four sailors of the schooner Mary Jane make a pilgrimage to Sainte-Anne-du-Bocage as soon as they arrive at the port to thank the saint for saving them during a storm. A staircase leading to the so-called miraculous spring, as well as a cave housing a statue, are built and blessed in the same year. The pilgrimage, which then belonged to the parish, was taken over by the Redemptorists of Sainte-Anne-de-Beaupré, Quebec, in 1920. A museum is inaugurated in the sanctuary in 1940 ; It includes letters, geographical maps, objects of worship previously used in the chapel and other objects, including some that belonged to Alexis Landry. In 1947, Martin Lavigne of Bathurst said he was miraculously cured of a disability after the pilgrimage, attracting a record crowd of probably 20,000 people the following year. The ritual of the blessing of the sick was established in 1949. 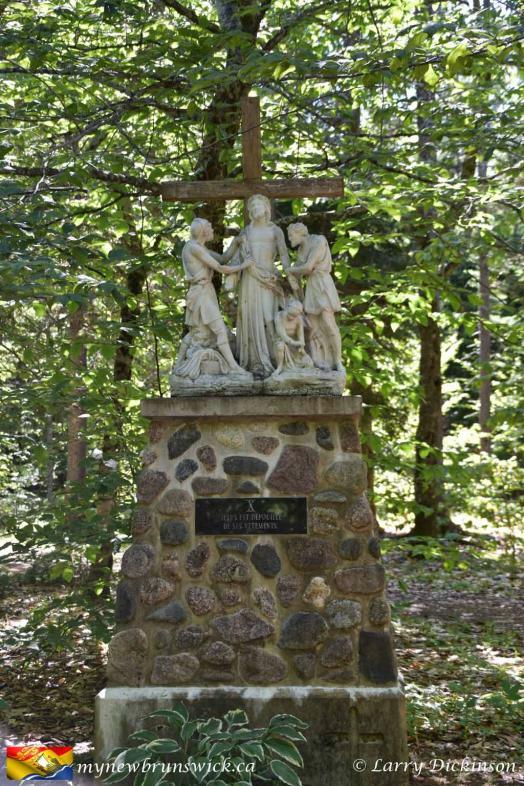 In 1951, the Capuchins of Bathurst and Listuguj (Quebec) took over from the Redemptorists in the organization of the pilgrimage. The construction of a Way of the Cross in the hedgerow of the grove begins in the same year. 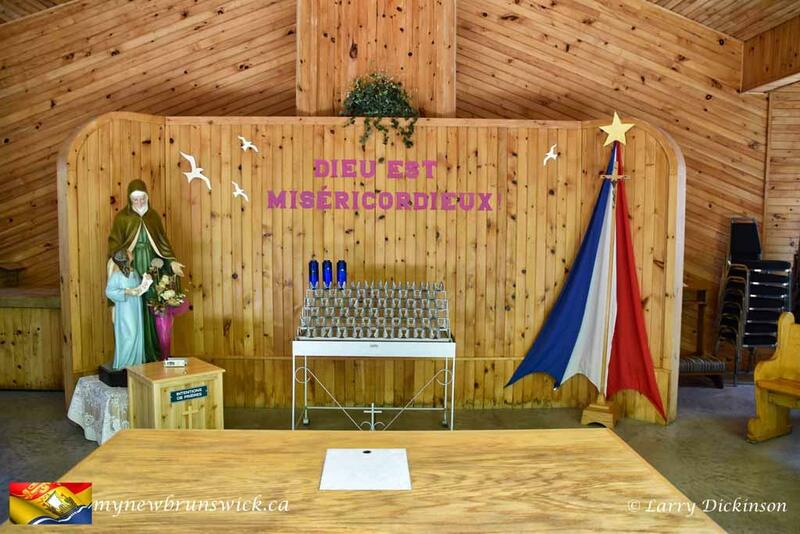 Moreover, the novena of the Sainte-Anne is now broadcast from Listuguj , intended for people who can not travel for the pilgrimage; By this twinning, the cult at Sainte-Anne in Acadie is no longer marginalized by its association with the Micmacs . 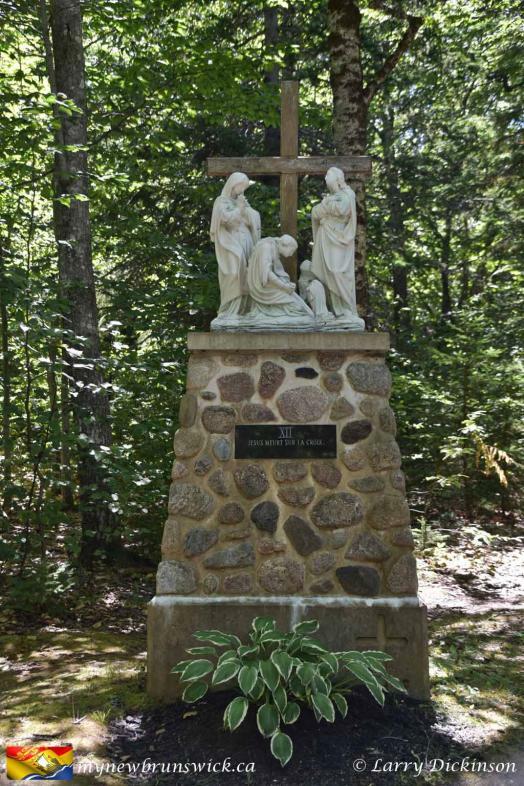 During the 1950s, the cult of Our Lady of the Assumption , the patron saint of Acadia , became very important; A statue with its effigy is inaugurated in 1952. 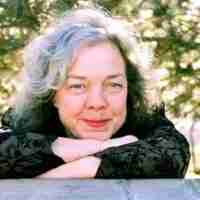 According to Denise Lamontagne, this has the effect of making the cult of Sainte-Anne in the Bocage a complement to that of Marie. The construction of the Way of the Cross ends in 1954, the Marian year, with the installation of the fifteen mysteries of the rosary. 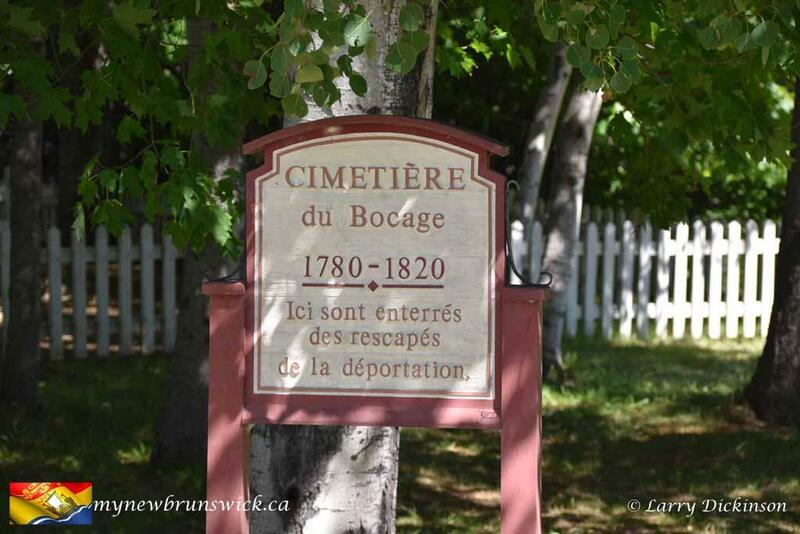 The portal was built in 1955 to celebrate the 200th anniversary of the Deportation of the Acadians. A stone and bronze monument bearing the effigy of Alexis Landry was inaugurated in 1956, on the occasion of the 75th anniversary of the first Acadian National Convention in Memramcook in 1881. Historical events and personalities, notably Alexis Landry and Marcel-François Richard, are highlighted during the novenas, making the Bocage a place of commemoration of Acadian nationalism. 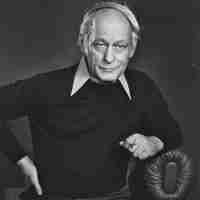 The monument to Alexis Landry is replaced by a stone monument unveiled in 1961 by the French writer Henri Queffélec. 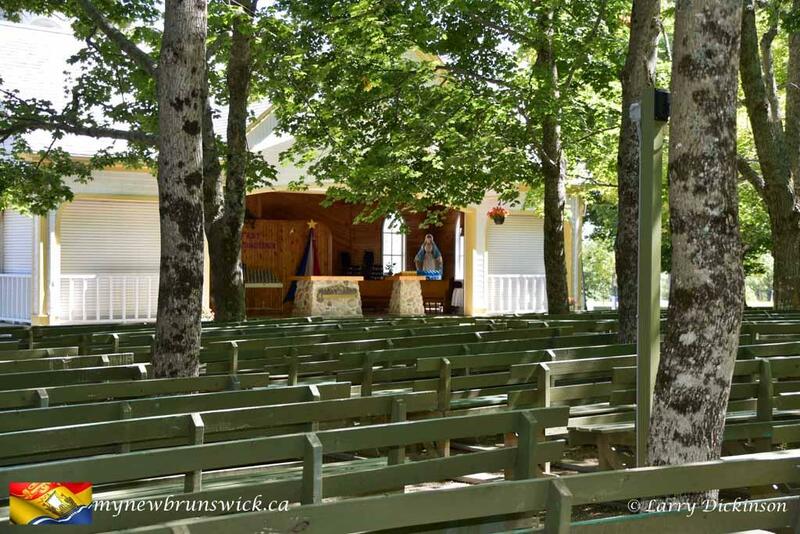 A replica of the chapel as it existed before the renovations of the 20th century was built at the Acadian Historical Village during the 1970s; This village is a tourist site located near Caraquet, recreating the life of the years 1770 to 1939 by means of forty buildings and costumed interpreters. 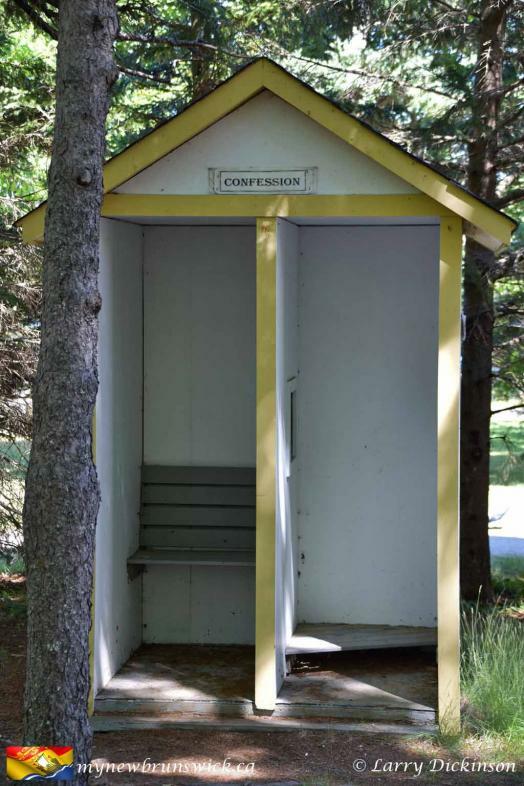 In 1975, a public toilet was constructed on the ground while the interior of the chapel was restored. In 1984, four pilgrims marching towards the Bocage found death in Paquetville. Stones were installed on the banks of the park in 1996 to protect it from further erosion. 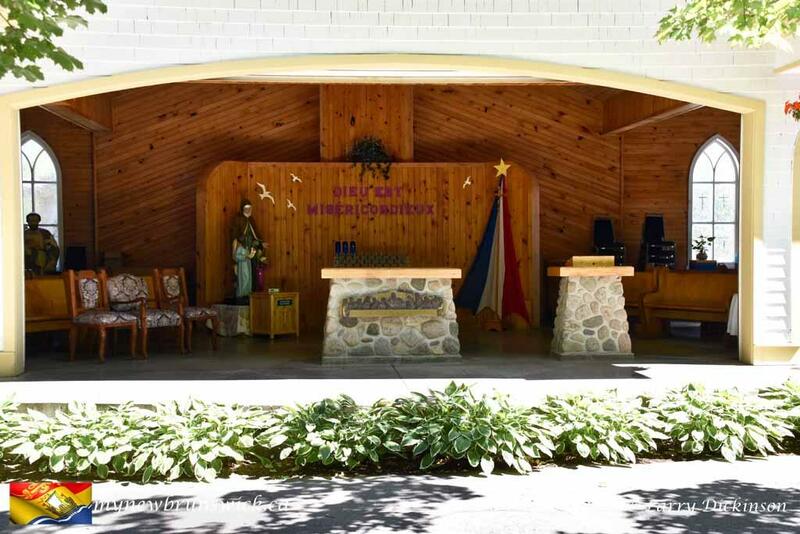 The chapel was renovated and enlarged in 1999. It becomes a municipal historic site on 1 November 2006 . The 26 July 2004 , On the occasion of the 400th anniversary of Acadia, Cardinal Marc Ouellet celebrates a Mass attended by more than 10,000 people. A monument commemorating the Great Upheaval is inaugurated on 28 July 2007 . The source is rebuilt in 2011 after a storm. 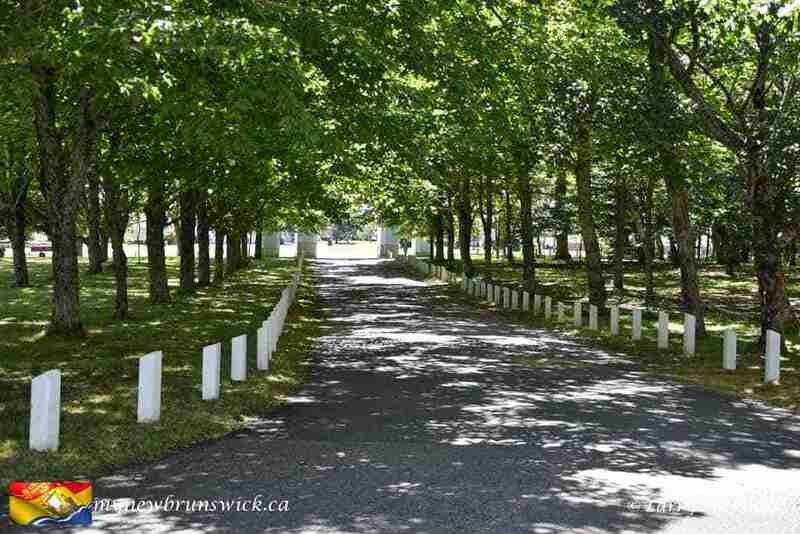 Beyond 260 people would be buried in the cemetery, but only a few tombstones still exist. Several of them correspond to the founders of the city, such as Alexis Landry, Louis Lanteigne, etc.. This cemetery is all the more important because it is one of the rare burial sites of survivors of the Deportation of the Acadians whose location is known . 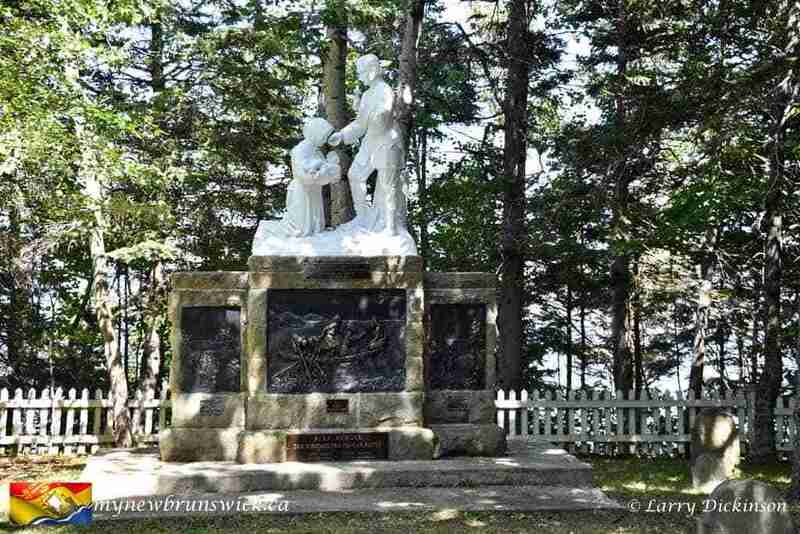 A monument overlooking the tomb of Alexis Landry depicts him waving his grandson Joseph-Marie in 1794. On the pedestal are three panels: the one on the left represents the Deportation of the Acadians, the one in the middle of the miraculous fishing and the one on the right the arrival of the founders of Caraquet. Some were erected to commemorate the memory of the other founders. 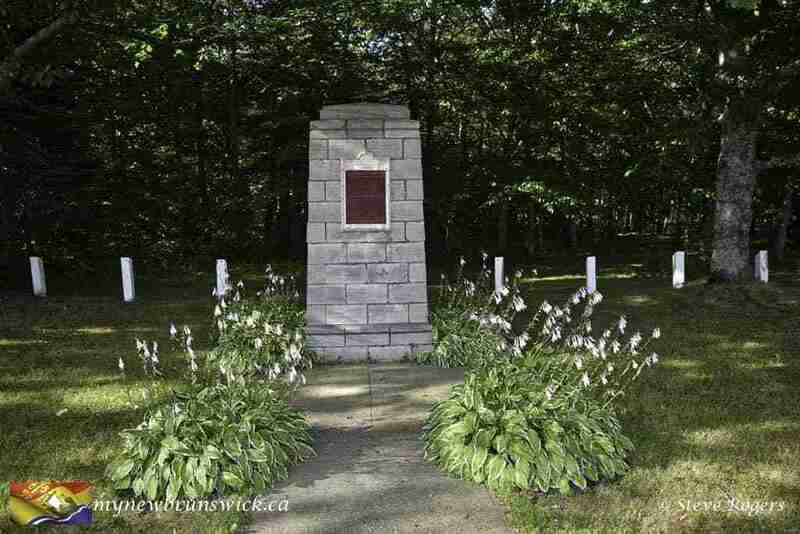 Monument commemorating the arrival at Caraquet of the Acadians, and their removal by British Army officer Roderick MacKenzie. To the south of the chapel is a monument of L’Odyssée acadienne. This series of monuments was installed by the Société nationale de l’Acadie in various sites around the world linked to the Grand Dérangement. These monuments are installed on a base in the shape of a star. On the four sides are two inscriptions, displayed in English and French. One summarizes this period of Acadian history and the other summarizes the particular events at the place where the monument is installed. A map, taking up part of the Acadie: The Odyssey of a People , appears at the top of the base. 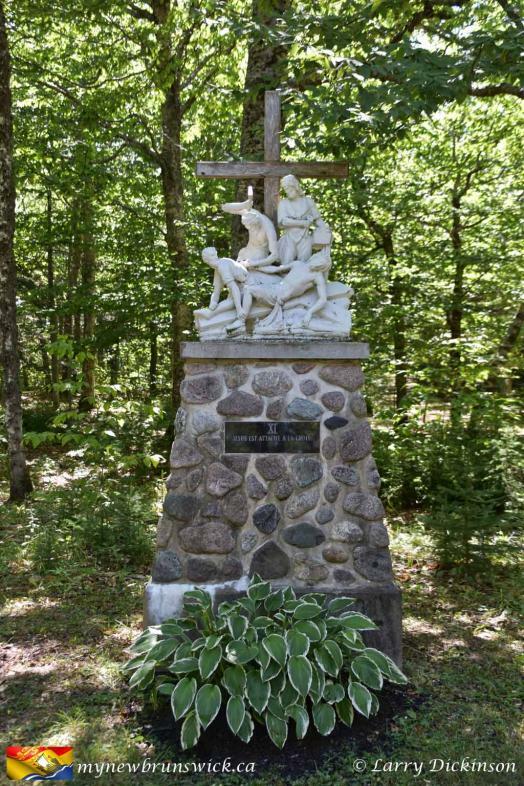 The monument is completed by a replica of the Cross of the Deportation of Grand-Pre. Ruins are located near the parking lot, on which a commemorative plaque was erected. 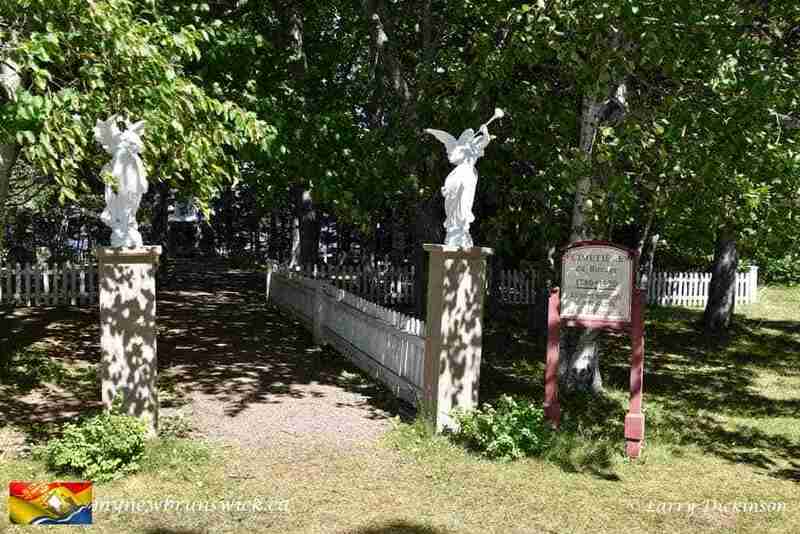 To the north of the chapel, a path of some tens of meters gives access to a staircase leading to a terrace on the edge of the bay of Caraquet. At this spot there is a fountain, surmounted by a stone cave where a statue representing once again Saint Anne and the Virgin Mary is located. The water from this source is considered miraculous by some, and many people come to drink or even bottled it. In the bay near the terrace there is a giant string of buoys . To the south of the chapel is also a well and a manual water pump. The park is a place used for various festivities during the summer. The whole begins on the 15th of June with the daily prayer of the Lauds in the historical chapel. The novena of the Sainte-Anne begins July 17th. On the night of 25 to 26 July, a pilgrimage takes place from the Saint-Michel Archange church of Inkerman to Sainte-Anne-du-Bocage, a distance of more than 25 kilometers. 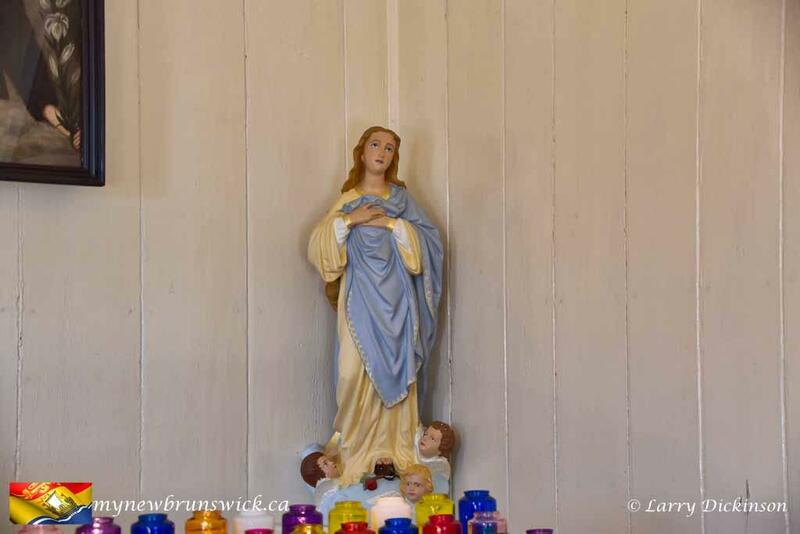 Several thousand people attend the feast of Saint Anne, locally called the “Good Saint Anne”, which takes place on July 26 and closes the novena. Several patients or handicapped attend this mass in the hope of obtaining healing. 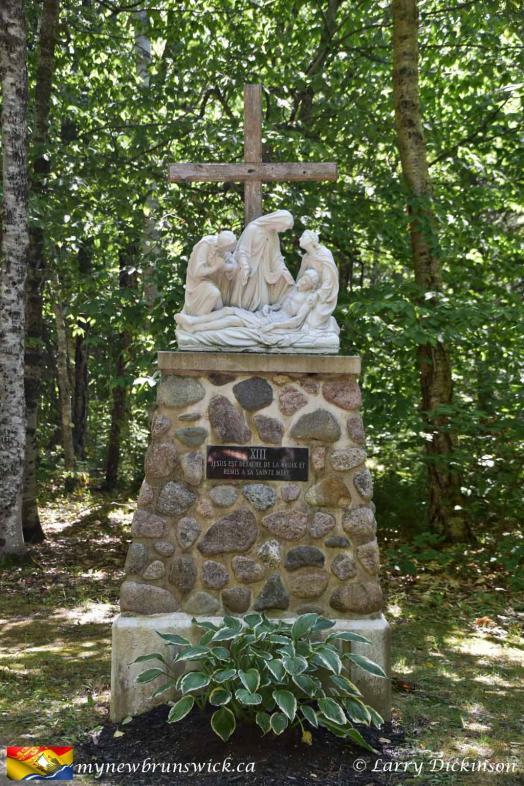 The sanctuary is also the site of a Mass on August 15 of each year, the day of the National Day of Acadia and Notre-Dame-de-l’Assomption, the patron saint of Acadia. This post has already been read 1264 times!